The old adage “many hands make light work” comes to mind when looking back on our Valentine’s Day this year. They certainly helped to lighten the load and bring merriment into a floral holiday that can be overwhelming and exhausting. There were so many helping hands this year and so many great things about Valentine’s Day 2017 at Honeysuckle Hollow that I just had to put them in a quick post. The three weeks leading up to Valentine’s Day this year were like a whirlwind. 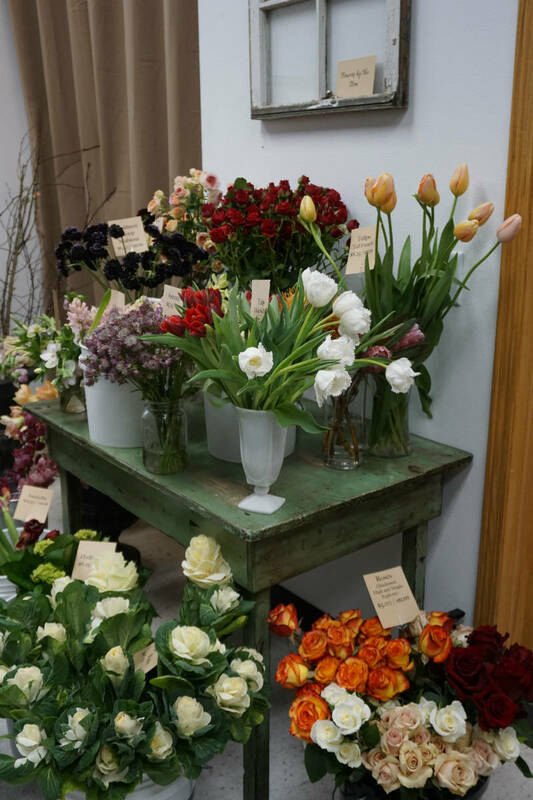 Amidst my ordering craze to find the best flowers in the world (literally, I bought from the Amsterdam worldwide flower market, among a variety of other places), we decided that some improvements to the shop were absolutely imperative. Dearest Vanessa was handed the task of figuring out how to get a walk-in cooler installed, my design room improved with better storage and raised up designing tables (to help all of our necks), along with building a new checkout counter to better serve our customers’ check out process. This was no small task, and in a very short amount of time, she had orchestrated and accomplished everything! I am not sure she slept much, and her house was turned into a wood workshop, but somehow she got it all done just days before the flowers began arriving! It was incredible how much these changes helped streamline our process when the flowers started pouring in. There was no way that the amount of flowers I ordered would have come close to fitting in our old display cooler, so it was undoubtedly a necessary piece in the growth of our little shop. We are now WAY more equipped to handle large events. The shelves she put into my cooler are the absolute best because once all the flowers are put into buckets on the risers, it feels like I am shopping at a flower market each time I step in to pick out flowers to design with. Pinch me! The organization, utility, and beauty of it made me keep wondering how I ever lived without these additions. All of the new cabinets in my work area have given everything a “home”, plus they were green when we found them on Craigslist, and let’s face it, I love green (much to my staff’s dismay sometimes!). All in all, the shop felt like a whole new place, and I kept gleefully working long into the night with a smile on my face. Not only did we have Vanessa and Summer helping at the shop this year, but we had all sorts of family and friends lend a hand. My son Cale was terribly sick during all of this, so he spent days sleeping on the floor while we worked away (thank goodness for a job where I can bring my kids to work with me when I have to!). And of course, I thank those who pitched in to babysit Cale so he could rest at home too. My daughter, Everly, as always was a huge help with everything from checkout to cleaning up the shop at the end of our open houses when I’m too tired to lug all the buckets and arrangements back into the cooler. Having Everly working with me is such a help with her efficiency, keen interest in the business of it all (always calculating sales throughout the day and evaluating expenses and profit), and her willingness to wake up at the crack of dawn and come to the shop on our open house days with her hair done, nails painted, and car packed up for me. Hopefully she will use these tools in her life as she learns about running a business, working in a family shop, the value of hard work, following your passions, handling customers, creative endeavors, floristry and so much more. Leading up to Valentine’s Day, Summer was, as usual, busy working behind the scenes – designing marketing materials, publishing blogs and newsletters, and designing flowers, as well as setting up our shop so it always looks beautiful. 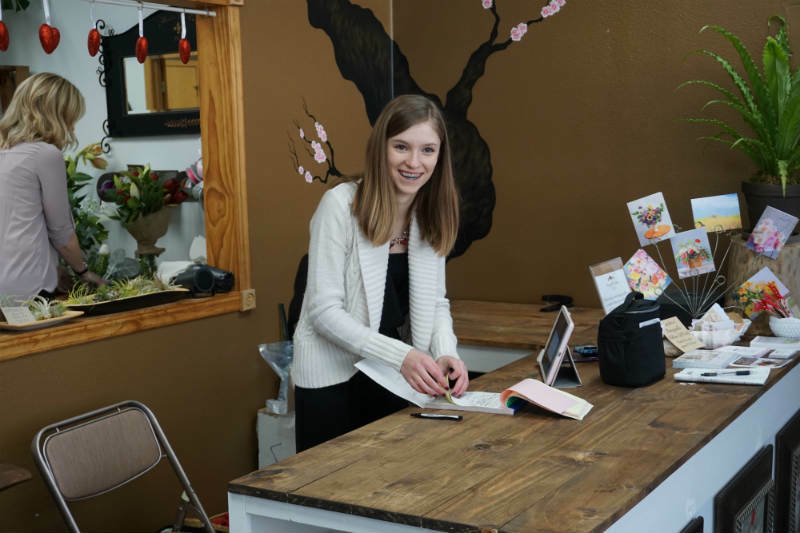 Everly, Vanessa, and Summer are incredibly proficient at running the shop for me so that I can create beauty and talk with my dear customers when they come in. I am incredibly fortunate for all of these ladies! I even had some friends from town come in on various days to help process flowers and do various other tasks around the shop. 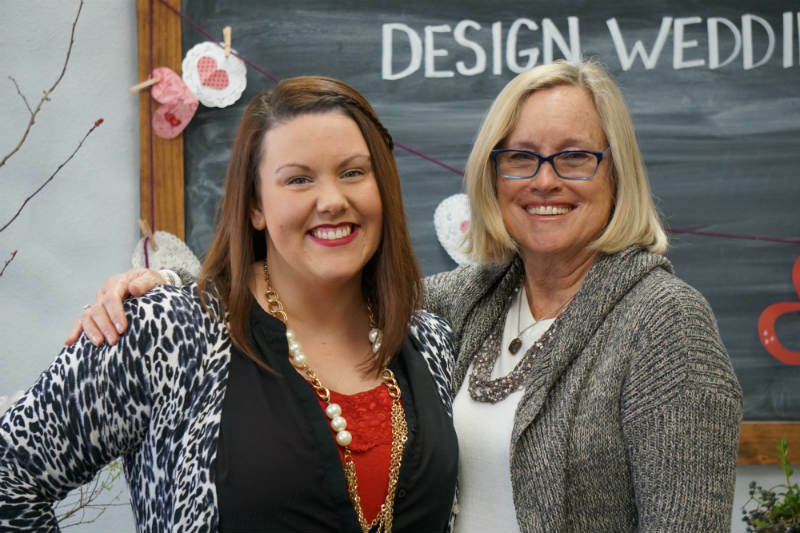 One day the talented flower farmer-florist, Alissa, from Alissa’s Flower Farm in Hull, Iowa come down to design with me in order to get a start on the MANY, MANY flower arrangements that we created. As always, it was a pleasure working with her, and I’m fortunate for her willingness to help fill in during the winter months when I need an extra hand. Then, the big fun this year, was that my Mom and Dad agreed to travel 16 hours from their home near Jackson Hole, Wyoming to help out at the shop. They arrived early and helped to cook, clean, and take care of my household (of course along with my sweet Hubby) while I was working at the shop processing and designing flowers in the week before Valentine’s Day. We were open at the shop 3 full days this year for Valentine’s Day so that we might best serve the community in this busy floral holiday (as opposed to our usual one day per month that we open shop to the public). I was ever so glad to have all the extra hands because it was BUSY! Word must be getting out about our little flower shop because we did a LOT of business in the three days we were open. It took My Mom, my daughter, and Vanessa to take care of check out and packaging. Summer was in the back with the flowers helping customers with me, and then on Valentine’s Day we had my Dad, Vanessa, and my dear mother-in-law running deliveries for most of the day. Honestly, I couldn’t have done it without all of you! The best part was, it was fun. Yes, it was busy, but with so many people that I love involved in the adventure, it was truly a pleasure to create and deliver beauty to the community. I was able to focus on the art of floral design while everyone helped to run the shop and take care of our customers. I have a variety of things I can improve upon for next year, as always, but overall this was our very best Valentine’s Days to date. For this, I thank everyone who helped out and, of course, everyone who bought flowers from us this year! We even had television station show up to do a segment on our shop. That, combined with our article in the Siouxland Life publication, seemed to help business for sure. That and social media. Thankfully, Facebook and Instagram posts keep spreading the word about the type of natural beauty that we create and the fascinating and beautiful flowers we use. All of this seems to be working to bring customers in our door! My gratitude for the growth of this business is immense. Lastly, I would like to thank dearest Sheila, of Blooms Floral in Omaha, Nebraska who is kind enough to provide occasional advice to me (as she has been in business for at least 15 years). When we were talking just before Valentine’s Day, she reminded me to have fun and to serve my community. So many florists get caught up in dreading Valentine’s Day with its achingly long hours of work, but she said simply to enjoy it. Enjoy all the flowers you get to order. Enjoy working late by ordering food and making it fun for your helpers. Enjoy the creative process. 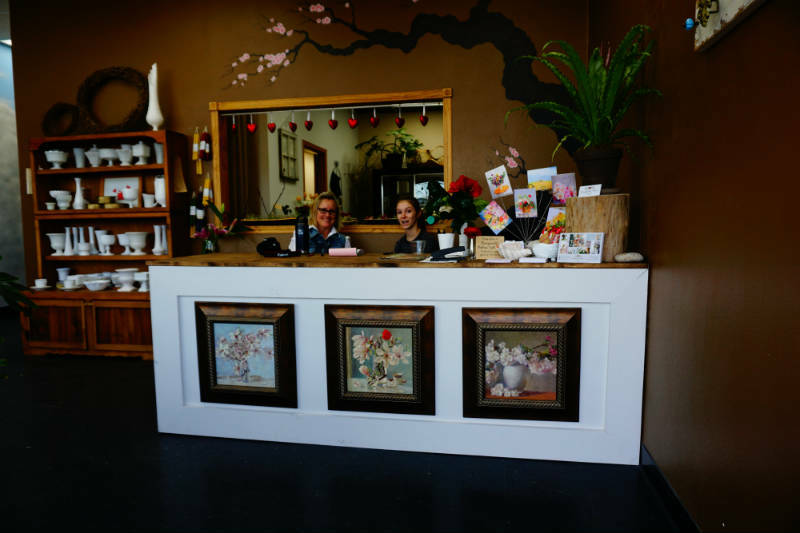 Enjoy bringing beauty to your customers and to those they love through flowers. Enjoy the simple act of sending messages of love through flowers. I honestly think those insights were what helped to make this holiday what it was - a joy. Thank you for reminding me of all of this, Sheila, at just the right time. After everything was over, I did enjoy a weekend away with my husband in the wide-open abyss of the prairie in the Sandhills of Nebraska, camping and riding horses all day in the unseasonably warm, sunny weather. During these two days away (thanks to my in-laws who watched my kids) I had time to catch up with my Hubby, sleep for endless hours, enjoy the outdoors, be with my pets, and truly rest. It was most rejuvenating, and I returned ready to get back to the shop and my family. It is amazing how little time it truly takes to recuperate if just given the time and space to do so. For me it requires the wilds of nature, a loved companion, and lots of sleep! And now with Valentine’s Day over, I am headlong into wedding season. I am doing consultations for new brides, proposals for weddings, last minute meetings with brides to discuss final details, ordering, sourcing beautiful hard goods and ribbons and the like….that is the fun part about being a florist. There is never a dull moment. 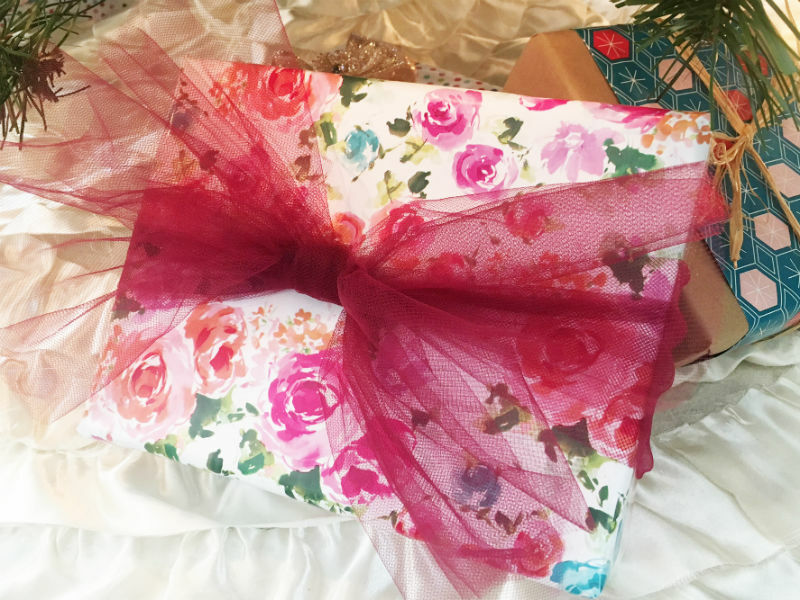 It's so easy to get into a rut when wrapping holiday gifts - especially if you are wrapping up more than just a few! Even though I LOVE meticulously and craftily wrapping up gifts that I have carefully chosen for loved ones, over the years I have come to the point of doing the bare minimum in wrapping the gifts quickly and efficiently (short of putting gifts in bags - there are lovely gift bags, but it's so much fun to watch my kids tear into wrapped presents!). I find myself sitting on the floor and wrapping with some old gift wrap (probably leftover from last year or a birthday) and writing - in Sharpie - their names on the top. After seeing so many creative ideas for gift wrapping on different blogs and, of course, Pinterest, I've decided to step up my game a bit. And I've tested out some various methods for you below. Here I used kraft paper, foraged items (either glued or tied on), twine, raffia, and baker's twine for some really natural looks that all coordinate. No time to forage? Well, we'll have small greens for you to purchase at our Open House this Saturday that you can add to your gifts! Or, just tie whatever string you have available (twine, raffia, ribbon, yarn, baker's twine) around a gift multiple times and add a little message! 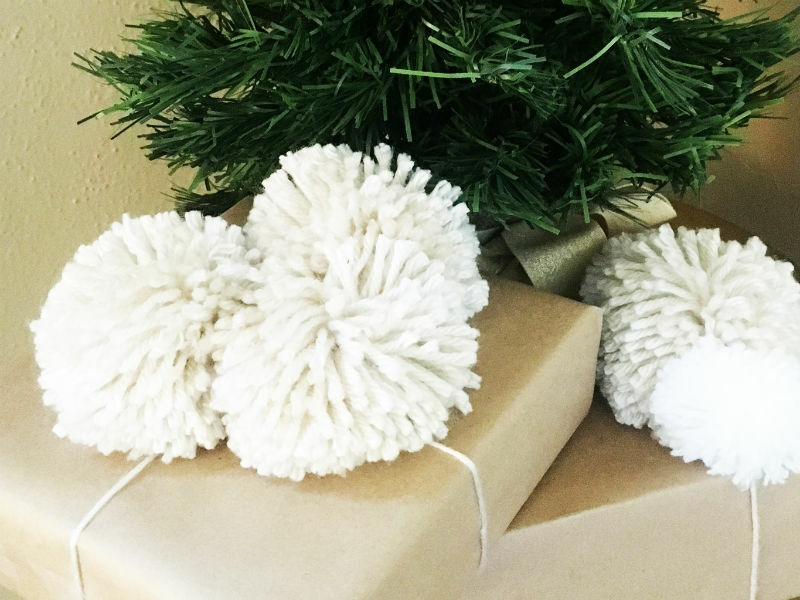 For those of you who enjoy some hands on craft time, you can make some poms or circle garland! (If you like the look of these, but don't have time to make them yourself, I've seen them available at Michaels Craft Store!) Here are a couple helpful tutorials: for poms and circle garland. And, finally, here are a few ideas using gift wrap. The first is tied with coordinating tulle (picked up from Hobby Lobby). The second gift I just layered some wrapping paper over the kraft paper and tied off with raffia! And for the third, I tied on a sparkly ornament to serve as my bow. None of these wrapping methods took long. (I have to admit, I already had the poms and circle garland created from past events, but I could have just as easily picked them up at the store!) But they add such fun elements to the gifts. 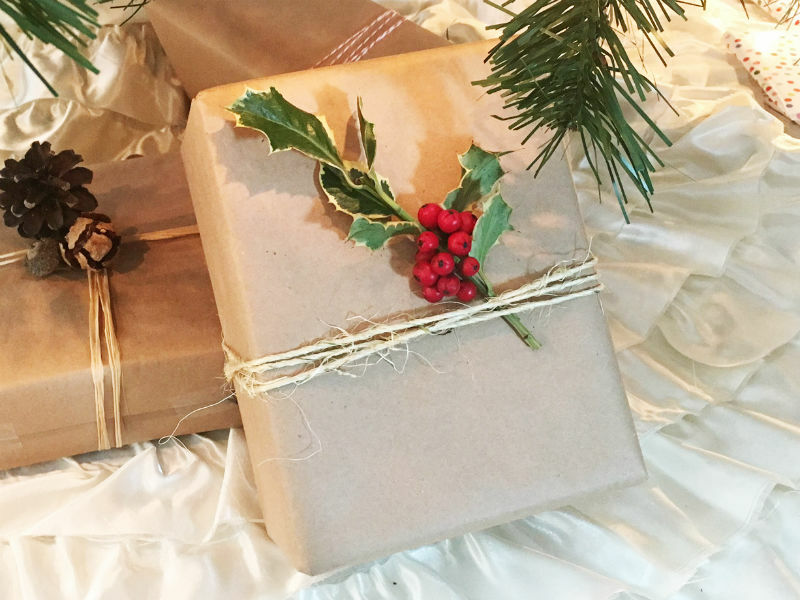 If you'd like to pick up some items to use for your gift wrapping this season, we're going to have some beautiful options available for you at our Holiday Open House on Saturday, December 10 from 10am - 3pm. We will have all kinds of natural elements to tie on, tags, and some of the most amazing botanical (holiday themed) gift wrap! Hope to see you there!